Volunteers from American Legion Post 390 and First United Methodist Church in Raymondville are working to build ramps for poor and disabled Willacy County residents. So far, they have built two ramps in Raymondville and Sebastian. Soon, they will be working on a ramp to help Texas Gov. Greg Abbott deliver a speech at a Republican Party fundraiser set for Nov. 3. RAYMONDVILLE — A group building ramps for disabled poor residents is gearing up for its biggest project — a ramp for Texas Gov. Greg Abbott. Veterans from American Legion Post 390 have joined members of First United Methodist Church to volunteer as part of the Texas Ramp Project. 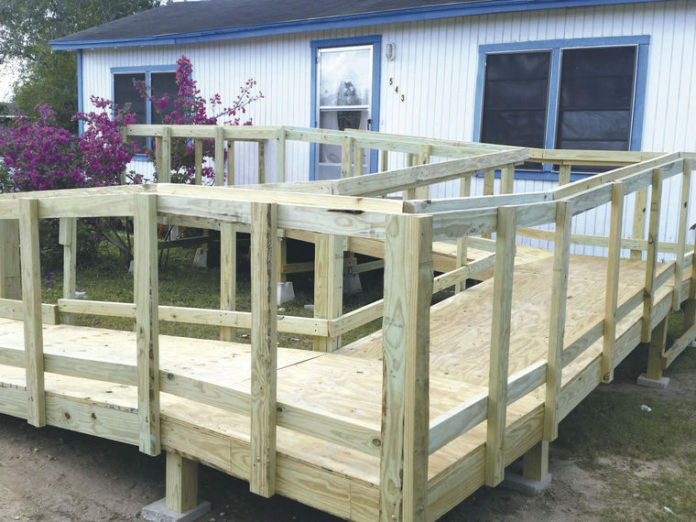 Since last month, the group has built ramps for two residents in Raymondville and Sebastian, George Solis, the project’s Willacy County leader, said yesterday. As part of the project, the group builds ramps recommended by health care professionals. For most projects, the group buys materials used to build the ramps. But for the project to build Abbott’s ramp, the Republican Party will obtain the building materials, Solis said. On Nov. 3, the ramp will help Abbott, who is wheelchair-bound, deliver a speech at the Willacy County Republican Party’s Lincoln-Reagan Dinner fundraiser at the Willacy County Historical Museum and Community Center. Abbott will become the first Texas governor to visit Willacy County in more than 50 years, said Wolf Chapa, president of the county’s Republican Party.